The traditional Mulino Bianco Nastrine Pastries are one of the most successful Thermomix recipe. Nastrine are one of the pastries Italian people love the most, they are always there during breakfast, snacks and breaks. Nastrine pastries are part of a group of snacks, "le Merende del Mulino" (that means "the Mill snacks", referring to the Mulino Bianco brand name, the "White Mill" in English), which was launched by the famous Barilla Group brand in far 1978 and included different types of brioches, bomboloni and croissants. 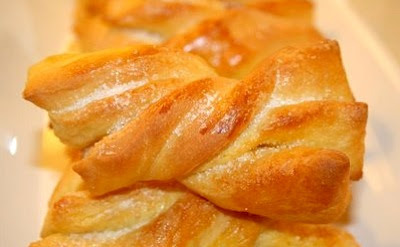 Since then, the delicacy of this leavened puff pastry gained Italian people's respect, from children to adults. The process could seems very difficult but it isn't and thanks to Thermomix it is also very quick. Recipe has been sent by Alessandra Patrone from Grottammare who suggests: " If you eat them immediately after baking they are fantastic! And if you heat them up in the microwaves oven for 15 seconds they are even identical to the original ones! The proof of the pudding!" Once in a while everyone should eat these pastries for breakfast together with a glass of milk or a cappuccino. So, we only have to try them!! Why don't we give them to our children for their half morning break? Thermomix helps you preparing healthy controlled food, similar to the industrial one but obviously better in quality. If you want to copy other famous recipe you may try the Baci Perugina Chocolates with Thermomix! While if you are looking for a breakfast idea, have a look at these brioches: Treccine Briosci cu Zuccaru, Cinnamon Rolls Cinnamon Brioches with Thermomix, Croissants with Thermomix, Pancakes with Thermomix. Or if you prefer a cake, Thermomix-Recipes has got a big variety of cakes such as the Yoghurt Cake with Thermomix, the Double Colour Cake with Thermomix, Italian Ciambellone Cake with Thermomix, Milk Cake with Thermomix: Bizcocho de Leche, Apple Pie with Thermomix and more! Put all the ingredients in the bowl. 4 Min Speed Dough Mode. Let the dough in the bowl and let it raise for 2 hours without removing the measuring cup. Take the dough off the bowl and divide it in two pieces. So roll it up in two long sheets to have big rectangles about 2-3 mm thick. Prepare the filling. Put the butter and the sugar in the bowl. 20 Sec. Speed 3. Brush with it a part of the sheet (about 20cm) and fold the second part on. Then brush again with more cream and go ahead like this until the dough finish. Make the same for both the two sheets. Press slightly with the rolling pin and cut 2 cm thick strips that you will roll up in the middle. Put them on a baking pan with greaseproof paper and let them raise 40 Min more. Preheat oven. Bake at 180°C for about 15 Min.